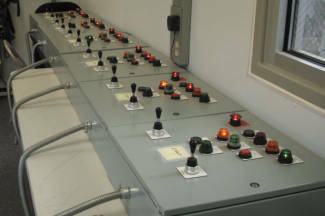 Push button control panels from small two button spout control to sloped top enclosures for complete loadout system control. Push button pendants, wireless or conventional hard wired with 20’ of SO cord. PLC (Programmable Logic Control) panels sized to match the system providing less field wiring and improved maintenance and trouble shooting ability. VPN (Virtual Private Network) connection can be added to a PLC system to allow DCL to remotely access and troubleshoot, allowing DCL the ability to make PLC changes remotely and diagnose and possibly fix a problem without having to send a field technician. HMI (Human Machine Interface) provides all the function of conventional push button control plus allows for graphic viewing of the system in operation. Also provides greater alarm indication and data logging for scheduling preventive maintenance. CCC (Closed Circuit Camera) system includes required camera(s) and viewing monitor to allow a truck driver to align their truck hatch with the loading spout as they drive into the loadout station. Motor starter panels, either stand alone or incorporated with the push button control panel or PLC panel, providing motor control for all of the systems three phase motors. The SmartLoader vision system is at the center of our recommended plant loadout automation system design. The SmartLoader Vision is a PC based system which can be integrated with bucket elevators, silo volume, flow control, truck scales, and the plant billing system. This allows for a truck driver to never leave his truck and drive away with a receipt in hand.